Plex.Earth enables thousands of engineers worldwide to have the complete 3D geographical view of their project sites within minutes, through Google Earth, Bing Maps, OpenstreetMap or any other WMS provider. 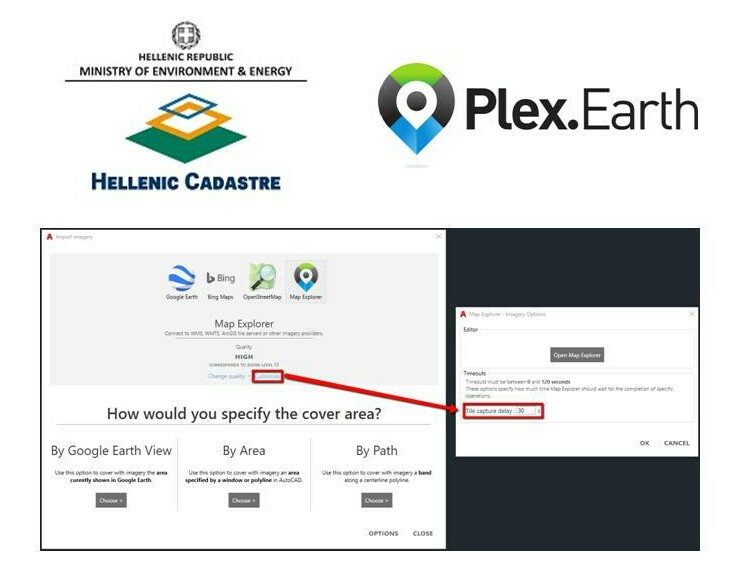 For those based in Greece, we have prepared a tutorial to show you how to connect to the Hellenic Cadastre with Plex.Earth 4, easily and quickly. The Hellenic Cadastre records the legal, technical and other additional details about real estate properties and the rights on them, meaning that every person or legal entity that owns a real property or a registrable right on real property is obliged to submit a declaration to the service. Due to the non-proper spatial representation of real estates mostly in rural areas, the submission of a dependent topographic diagram is required. Thanks to Plex.Earth’s integration with the Web Map Service (WMS) of the Hellenic Cadastre, every land surveyor and civil engineer can have the real-world representation of a land property. Also, with Plex.Earth’s 4 powerful mosaic tools, you can import hundreds of high-resolution images into AutoCAD from the service and merge them into one in few minutes, covering even the largest areas. You can read our tutorial here and try Plex.Earth 4 for free today!